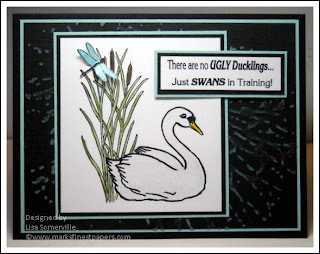 Thanks for stopping in today for the Creative Inspirations Paint Challenge. This week Marti issued the team a Beach Themed Color Challenge using the wonderful CI Paints. That was pretty easy, since there are so many wonderful colors of this shimmery paint! ETA - see the Creative Inspirations Blog for some Blog Truffles! I also went with "water themed" images. All stamps used are from the set Our Side of the Pond from Marks Finest Papers. 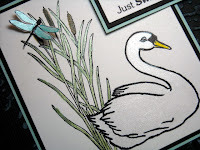 The images are stamped in Black Archival on White card stock, masking the Swan to add the cattails. Then using an H20 Brush I painted the images with the following Creative Inspirations Paints in Fairy Dust, Buttercup, Sky Blue, Green Olive and Tan. The Background was created using a Texture Fades Folder and Black Magic card stock from Core-dinations. Sanding the embossed area with a Sanding Block to have the core color show through. Be sure to stop by the Design Team Blog to see what the other Designers created this week. Team B will be posting their Beach Themed creations next week. Lovely image and wonderful design. Love teh embossed paper. Beautiful card. Beautiful card, so relaxing to look at! Luv that bg, really goes great together! Love this image--the colors you used almost could go with the PDCC challenge;) LOVE IT! You are super creative! Beautiful! I love this image and the colors are great! This card is beautiful! 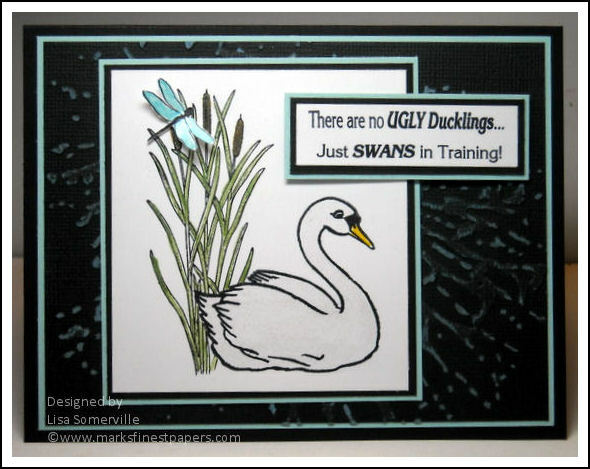 I love the background plate that you used, and how well it works w/ your image! Awesome job! Beautiful card, has an elegant feel to it! really nice, love the little dragonfly detail! Great job on the card! 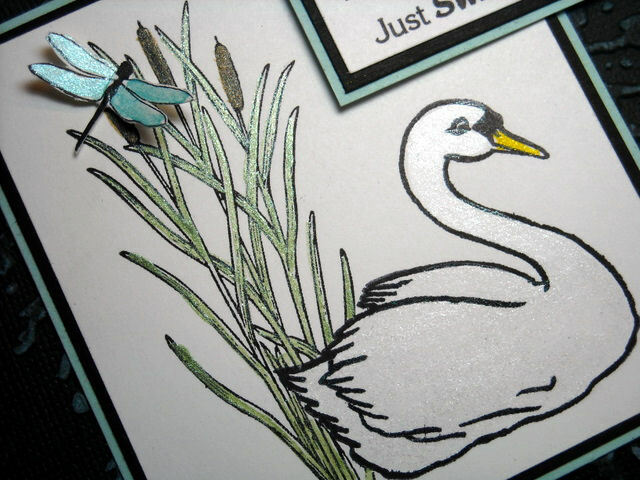 Love the shimmer and detail in your card! Love the little dragonfly!! Very pretty! You made a beautiful card. I love the images that you used and the shimmer really shows on the dragonfly. Great sketch and cute card!